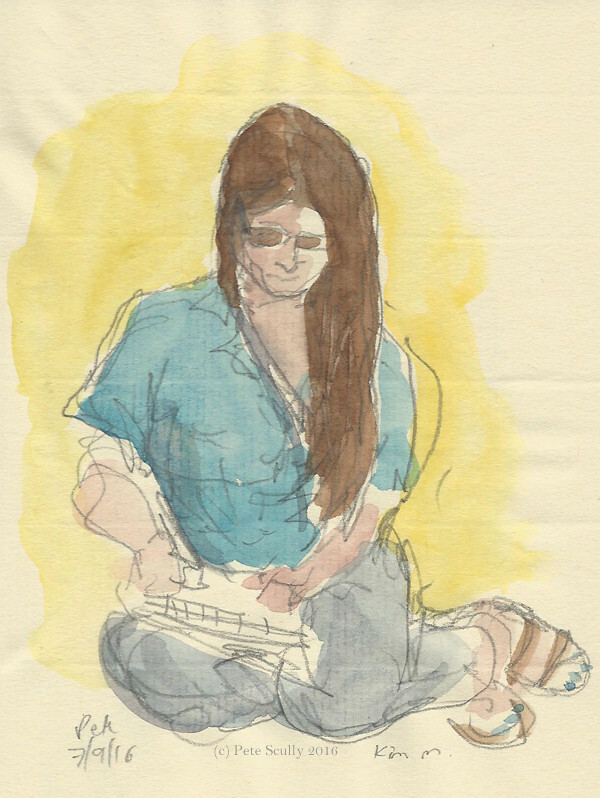 This is the Davis Farmer’s Market, a sketch that I did while standing up for the best part of two hours, occasionally talking to people. It was busy, though by the time I was finished all the people had gone and the market stalls had all but packed up. This was the longest sketch I did as part of the “Let’s Draw Davis” sketchcrawl on Saturday, the return of the sketching meetups I used to organize monthly for a few years until my weekend days got just too busy. It was really nice to get out there and sketch with others again, see some old familiar faces, and meet some new sketchers too. We started off at Central Park, and I did some quick people-sketching in my Fabriano sketchbook, using pencil and watercolour. 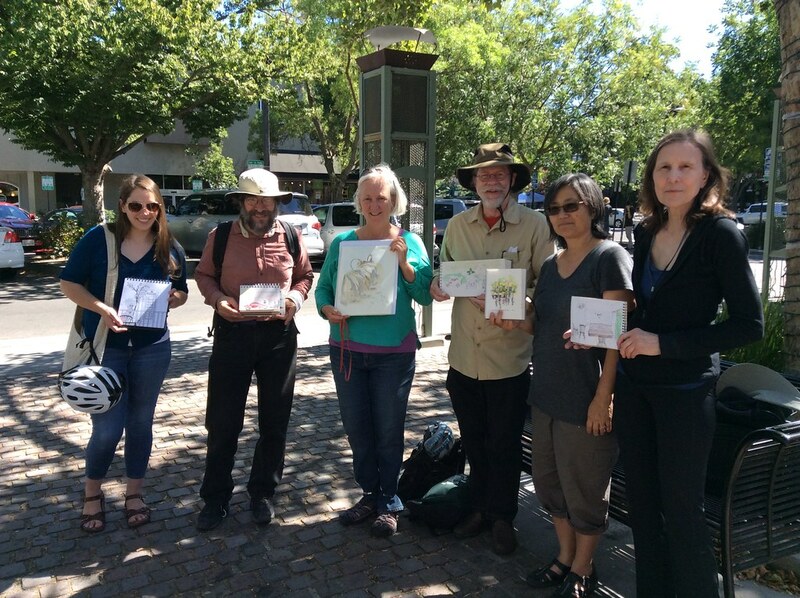 There was an even going on speaking up against oil trains, those big hulking freight trains that carry oil dangerously through residential areas (such as Davis). 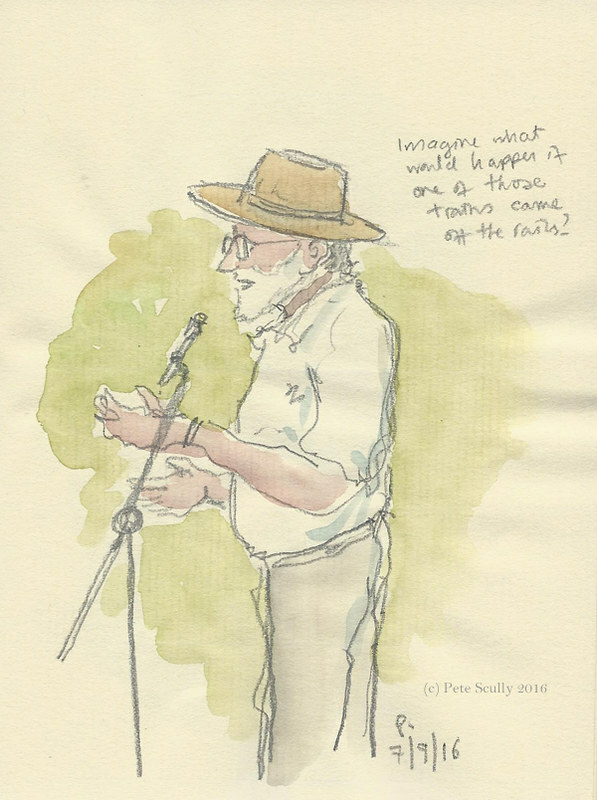 It was interesting to listen to, I support their cause and I sketched some of the speakers. Look at me sketching people eh. Below, some of the other sketchers. 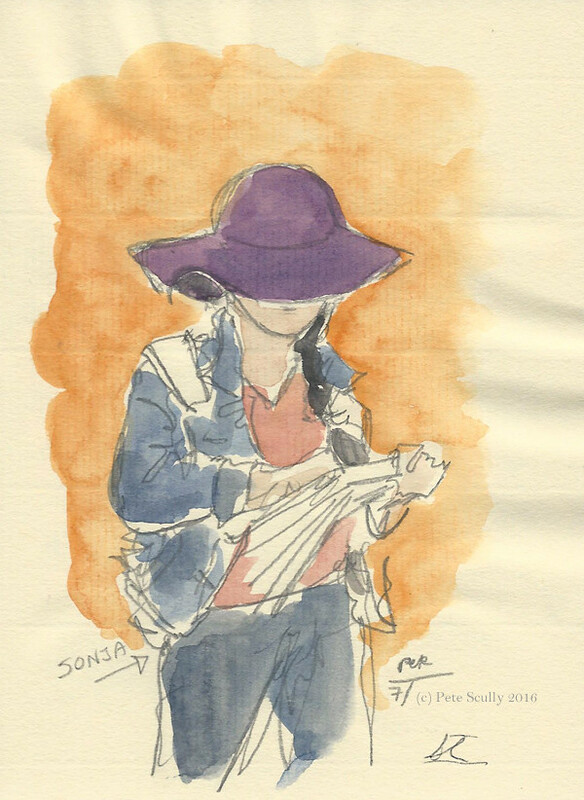 In the first sketch, of Sonja in the purple hat, I showed off my favourite tip for drawing people, draw a massive hat and avoid the face at all costs. No I’m only kidding, but it looks like that’s what I’m doing! I’m quite pleased with this sketch though, I like the way it turned out, full of character, showing the sketcher busy at work. 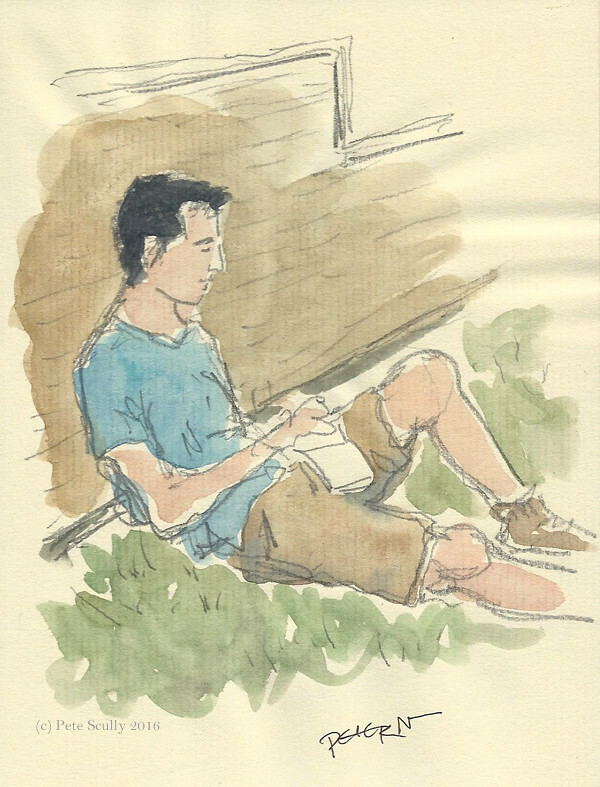 The other sketchers drawn below are Kim, Sam and Peter, three different seated poses, three different angles. I used three sketchbooks on this sketchcrawl because I enjoy carrying loads of stuff around with me. No, Seawhite #4 was at a close (the Farmer’s Market sketch was the last double-page spread, though the penultimate sketch – I actually finished it next day sketching the Euro final). 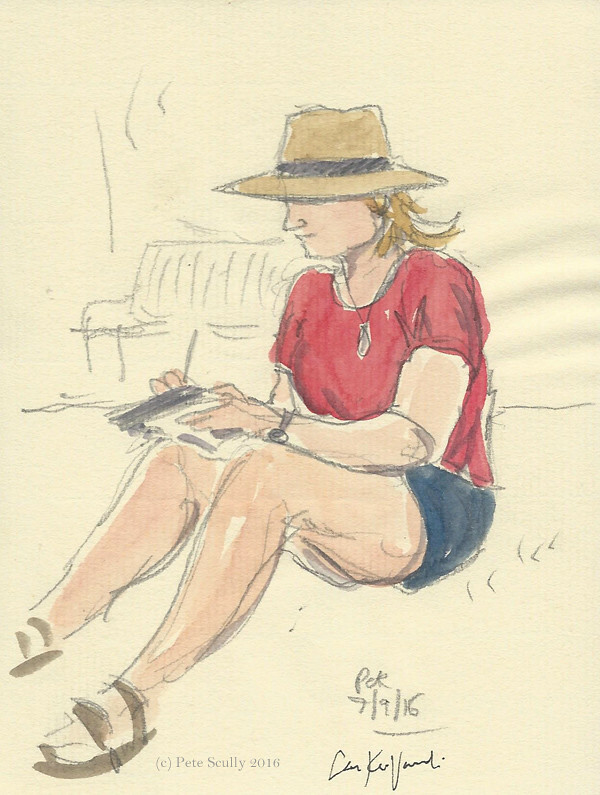 I enjoy the Seawhite of Brighton sketchbooks now, after seeing what other sketchers did with them when out in France last year, and I was pleased to see another sketcher, Peter, also using a Seawhite. I opened a new sketchbook, the Stillman and Birn ‘Alpha’ landscape, my third one of this particular model (though I have a few other sizes of the Alpha, it’s my favourite paper I think). 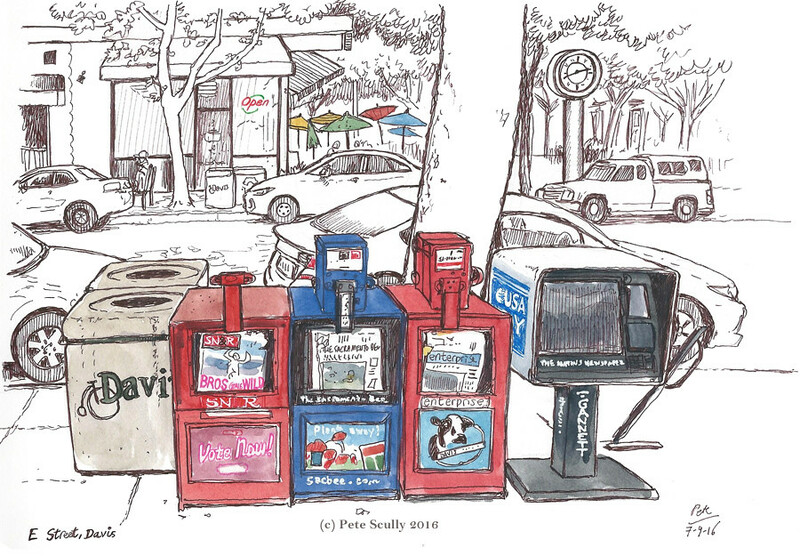 I drew the newspaper boxes outside Peet’s Coffee in E Street, while my legs started to hurt from all the stand-up sketching. I need to use my stool a little bit more (but I do like having the elevated view of standing up). And then the remaining sketchers met up at the end to look at each others sketchbooks, which is always nice. We got a lot of very nice sketches done that day. Here is a photo I took of everyone holding up their books. By the way, we didn’t lay them all out on the floor and stare at them from six feet up like too many sketchcrawls do these days (pick them up! Pass them around!). 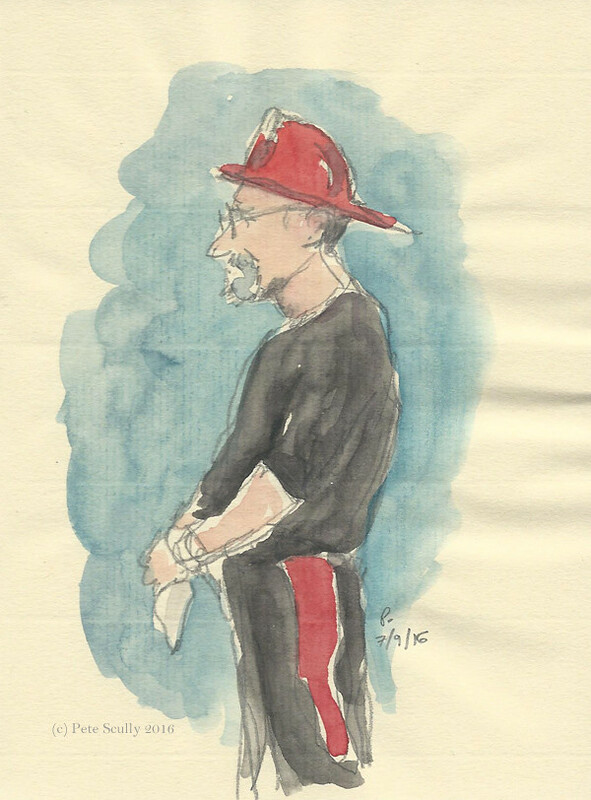 Some of the sketchers that didn’t make it to the end did come and find me before they went and I got to see what they had done, and a few others met me at De Vere’s afterwards having not been at the E Street Plaza end point, so overall it was a very nice day full of sketching in Davis. 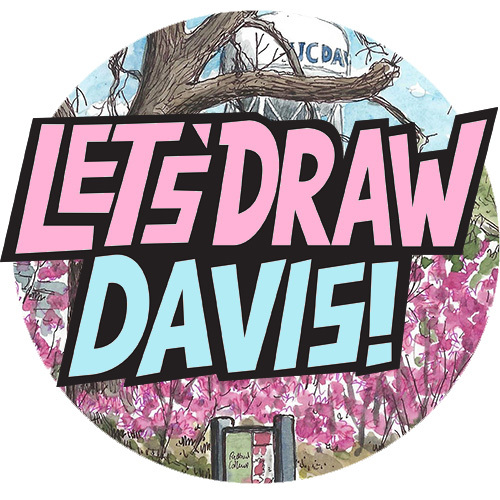 I do plan to restart Let’s Draw Davis on a monthly basis, but not until October, to coincide with my sketchbook exhibit at the UC Davis Design Museum. In the meantime, Davis sketchers, keep up the good sketching work! Thanks! Drawing dancers is difficult, got to be quick, lots of gesture. Fun though! Ronaldo…I did sketch him, but just a close-up of his face with the moth on it. Poor lad, his injury sounds bad. While I was rooting for France, I’m glad Portugal won, and was glad for him to lift the trophy too. Nice to see a good group out there again. I wish I could have been there but was at an illustration conference (ICON9) in Austin … which, by the way, you should really go to the next one! (The location of ICON10 is not determined yet, but will be in 2018.) 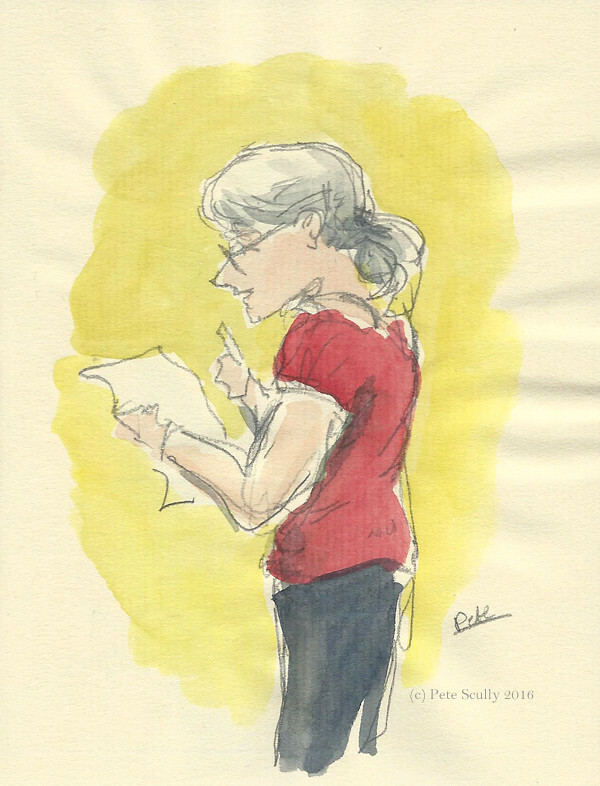 Anyhow, I hope I can make it to the next sketchcrawl in October. Thanks for starting them up again! So sorry to miss this one. Was going to be in town as a nice coincidence … but had to cancel my travel plans suddenly. Am hoping to swing by in October though … can’t wait to see the next event posted! Hello! I was really happy to looking down through all of your wonderful sketches and see a group shot. I have always wanted to do a group sketch, but have yet to do one. Love your work Pete! Thanks for sharing!